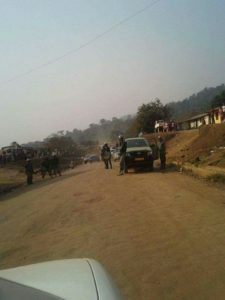 Some disgruntled youths of Bali in Mazem Division, Northwest Region, January 16, forced their Divisional Officer, DO, to respect the Ghost Town call made by the Cameroon Anglophone Civil Consortium. The Post learnt that all educational institutions and commercial activities were grounded in Bali in respect of the call. The DO of Bali, Divine Kamera, and his ‘Etat Major’ were going around, convincing the population to ignore the Consortium’s call. But the DO was taken aback, when a group of indignant youths stormed his office and forced him to respect the Ghost Town. He was ordered to immediately leave the office and return home. The irate youths reportedly told the DO that the Consortium was leading a just fight for the good of marginalised Anglophones and threatened to burn down the Subdivisional Office, if the administrator refused to leave. Kamera obeyed the instruction and left the office. The Post further learnt that another group of youths also stormed the office of the State Counsel in Bali. There, the youths did not order the State Counsel to leave the office, but rather locked the State Counsel and his staffers in the office as punishment for violating the Ghost Town call. “The youths locked the main door of the office and went away. The personnel at the State Counsel’s office had to jump out of the office through a window behind the building and vamoosed, leaving the State Counsel behind. The State Counsel was only rescued later,” our source asserted.